The tips of bits used for drilling into concrete, brick or block are made out of carbide. These straight shank carbide-tipped bits are used in mechanical hammer drills. The carbide bits are attached to the hammer drills via a chuck. The straight-shanked bit is used in a Jacobs style chuck (the kind that requires a key for use). The tips of bits used for drilling into concrete, brick or block are made out of carbide. 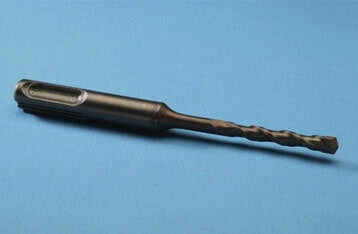 The SDS carbide bits are used in electro-pneumatic hammer drills. The SDS carbide bits are attached to an electro-pneumatic hammer drill via a keyless chuck. The tips of bits used for drilling into concrete, brick or block are made out of carbide. The Tapcon® bits come in two diameters – 5/32” and 3/16”, and lengths of 3-1/2” to 7-1/2”. The 5/32" bit is used for the 3/16” Tapcon® and the 3/16” bit is for the 1/4” Tapcon®. The tips of bits used for drilling into concrete, brick or block are made out of carbide. The SDS Max carbide bits are used in large electro-pneumatic hammer drills. The SDS Max carbide bits are attached to an electro-pneumatic hammer drill via a keyless chuck. The tips of bits used for drilling into concrete, brick or block are made out of carbide. The Spline drive carbide bits are used in electro-pneumatic hammer drills. The Spline drive carbide bits are attached to an electro-pneumatic hammer drill via a spline designed keyless chuck.